“You’ve got to be kidding me!” The cacophony of fire alarms were rattling my brains. I looked up at the hairstylist, who had set her jaw and increased her pace. 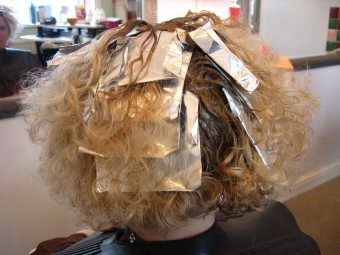 Layers of foils floated around my face. “Do you think we should stop?” I asked. “I’m comfortable going on if you are.” I had visions of half highlighted, or worse overprocessed hair, burning as I shivered outside the mall waiting for the all clear. What had begun as a trip to get my highlights redone (yes, I know you’re shocked, and no, I’m not naturally that beautiful!) had turned into quite the adventure. Shops closed. Thousands of disappointed Saturday shoppers made a beeline for the next mall down the way. The lines of the song ” should I stay or should I go now,” ran through my head. My stylists fingers became a blur as she raced against time and possible evacuation. They closed our salon, and all of the hairdressers, myself and one lady in the middle of a mancure, slouched low in our seats so as to be out of sight from the hallway. Perhaps the firemen wouldn’t notice us. All the while the alarms bleated and blared. In the book “Don’t Sweat the Small Stuff” by Richard Carlson, one of the chapters is entitled “Life is Not an Emergency.” That phrase has become one of my favorite mantras. Weekly, daily sometimes, situations arise that trigger my adrenaline, my flight or fight response. Whether it’s a national issue requiring fervent prayer, bills that are coming due, or Hannah staggering under the weight of a grade 12 courseload, my internal alarms can crowd out other sounds. I’ve heard it said that there is no panic in heaven, only plans. Consequently, I’m learning to dial down my response. Learning to hunker down, to find the secret place. Learning to just keep “steady as she goes.” Sometimes I do it well, sometimes not. Yesterday I did all right. Though the alarms were loud, the danger wasn’t immanent. We were alert, but stayed on course. The enemy’s plans to wreck my day and hair were “foiled” again! (ha! couldn’t resist). Life is not an emergency. And I’ve got the ” new doo” to prove it!